A delicious carmel-butter aroma hits your nose when you first smell this tea. 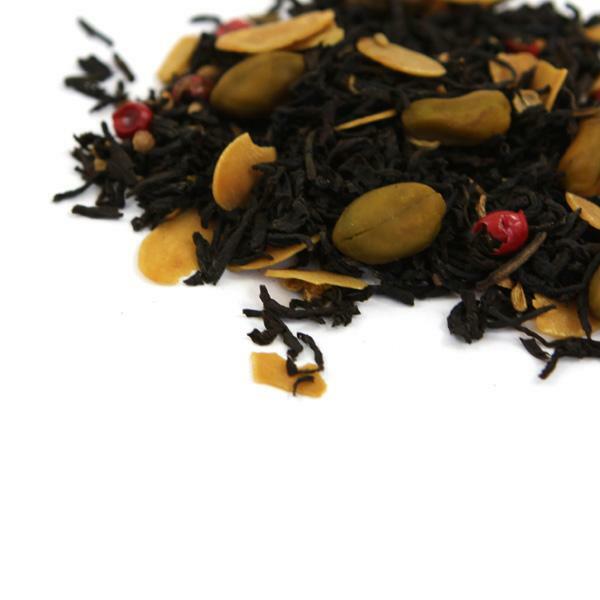 Nutty overtones become more pronounced the longer the tea is brewed, and it ends with a smooth, buttery finish. This tea is part of the Sanctuary Sampler Kit. These kits are pretty nifty, and I must say that I’m quite jealous that I didn’t think of such a thing myself when I was actively selling tea! The samplers come in a neat little chipboard portfolio, with the five teas affixed to the inside of the portfolio, and includes printed index cards with a brew chart, tea information, and information about Sanctuary T. Included also are small packages of T-Sacs and small bamboo skewers, making this kit a perfect gift for someone who is new to loose leaf tea. I am not new to loose leaf tea, so I opted to brew the tea the way I usually brew it, in my Smart Tea Maker. The amount in the sample package is just enough for my Smart Tea Brewer – I like it when things are all convenient like that! There is also a nutty taste to it from the pistachio, almond and coriander. The coriander also provides a warmth of its own, as well as a whisper of tangy citrus that sits at the very tip of my tongue. There is not a lot of astringency to the cup, but there is a slight bitterness to it, but it is not distracting, and I found that a little bit of agave nectar went a long way in sweeping away any bitter notes as well as highlighting the caramel-like undertones to the tea. When I first read these ingredients, my immediate thought was “this is a chai” – although there aren’t any classic chai ingredients to the blend. This is because in my own chai blend, I use coriander, cumin and peppercorns. Because this does have similarities in taste to some chai teas that I’ve tasted, I am going to categorize it as a chai… if for no other reason than that I can! But I digress! This tea is fantastic, and I am glad that I tried it! The creamy caramel-ness of this tea is accented further when I add milk to the cup, so I recommend doing so.